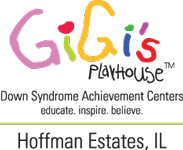 GiGi's Playhouse in Hoffman Estates is the very FIRST playhouse created by Nancy Gianni after she  gave birth to her beautiful daughter GiGi in 2002. Her birth sparked a remarkable journey of miracles, hope and unconditional love that is now helping hundreds of thousands of people every day. What began as a mother's vision to change perception, and maximize her daughter's successes, has evolved into a global movement of acceptance for ALL! Programs are created by professional therapists and teachers who generously donate their time and expertise. All programs are based on best practices for learning styles specific to Down syndrome, and customized to ensure individual success. GiGi’s Playhouse serves infants through adults. GiGi’s Playhouse is headquartered here in Hoffman Estates, IL; with 40 locations throughout the United States and Mexico, with more opening soon. GiGi’s Playhouse is the ONLY international network of Down Syndrome Achievement Centers created to provide FREE life-changing therapeutic and educational programs for all ages. To change the way the world views Down syndrome and to send a global message of acceptance for all. To see a world where individuals with Down syndrome are accepted and embraced in their families, schools and communities. We change lives through consistent delivery of free educational, therapeutic-based and career development programs for individuals with Down syndrome, their families and the community, through a replicable playhouse model. A lifetime commitment to families. With over 40 brick and mortar and pop up locations across the United States and Mexico and 200 inquiries to start new locations all over the world, GiGi’s Playhouse is the ONLY network of Down Syndrome Achievement Centers. Every day, we provide FREE, life-changing therapeutic, educational and career training programs for 30,000+ individuals of all ages. Down syndrome is the largest chromosomal disability in our country and yet, it is the least funded. From a prenatal diagnosis to career skills, we make a lifetime commitment to remain by their side. Families are empowered with all the tools their child needs to succeed! Through free programs and through our Generation G Campaign for global acceptance, we EMPOWER families by maximizing opportunities for daily achievement and lasting acceptance. To ensure lasting acceptance, we must show the world what individuals with Down syndrome are truly capable of achieving as students, co-workers, volunteers, friends, and valued members of their communities. Our program outcomes help advance this vital social impact goal. "I walked out of GiGi's Playhouse smiling, and I feared no more."